Guardamar del Segura is a town that through the course of its history has been able to take advantage of the natural adversities that have befallen it. With 9.326 inhabitants and sited at the mouth of the Segura River, the town has always held a key position as a guardian of the river. Most people coming to Guardamar by plane fly into Alicante's International Airport "El Altet", which is located south of Alicante. Guardamar del Segura is approx. 30 min. drive on the highway N332, the road that runs all along the Costa Blanca. 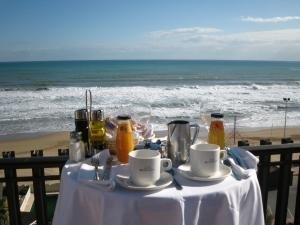 There are only 15 Hotels in Guardamar the list can be found by clicking the following link Hotels Guardamar. If you wish these can be booked while you are on line. The old town was built on a hill which was skirted by the river Segura. Still preserved are the ruins of a castle and other historic remains are from Hellenic times, when this town was a port. 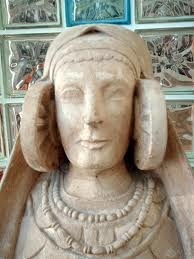 On the Iberian site of Cabezo Lucero an important archaeological find was made, and the bust of a woman was discovered. It is now called the Dama de Guardamar, and it is similar to the famous Dama de Elche. Another archaeological site from Arab times is the Mosque of the Caliphate Rabita. In 1829 an earthquake completely destroyed the original walled city and the castle that was at its centre, although remains of these can still be seen. This forced the inhabitants to move to Guardamar's present location closer to the coast, and to design the town so that it could withstand earthquakes. At the end of the 19th century the town experienced serious problems as a result of the advancing sands. To combat this, rows of pine trees were planted, which now give Guardamar del Segura its striking combination of woodland and beaches, and have halted the advance of the sands. Today the area "Dunas de Guardamar", and has been declared an Area of Natural Interest. The Reina Sofia Park is a good place to walk and admire the scenery within a magnificent setting of native flora and fauna. The park is beautifully landscaped with lakes, waterfalls and trails. 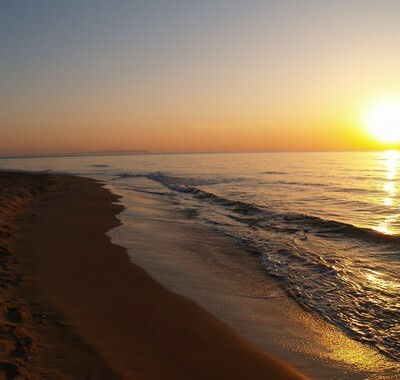 Guardamar's 14 km of coastline has fine sandy beaches. The Centro and Roqueta beaches are the most popular, whilst others like the Moncayo and Los Tusales, which are at the mouth of the Segura River, are less crowded. Some of the Guardamar del Segura beaches were awarded the Blue Flag. This is an award by the European Union to beaches, marinas and parklands which maintain a high standard in environmental issues, such as clean water and sand, and facilities such as toilets, disabled access, etc. This is a beach of fine sand and it is located in Guardamar del Segura. In 2001 it was awarded the blue flag. This sandy beach is not as crowded as the other ones, and it is situated next to the mouth of the Segura River. 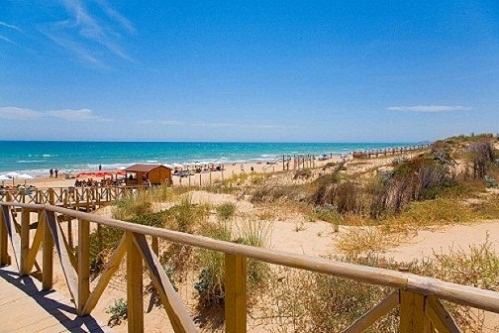 This unspoiled beach with dunes and pine trees is located about 6 km south of Guardamar, in the direction to Torrevieja. This beach was awarded the blue flag award in 2001 and during 2003. 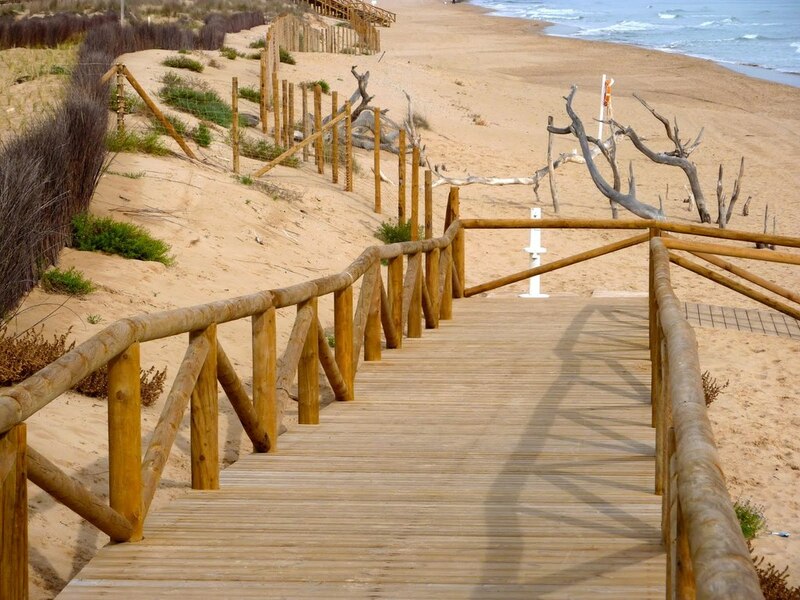 This beautiful beach with dunes and pine trees is located to the south of Guardamar del Segura towards Torrevieja. It is located close to the Pinomar and Urbasol urbanisations. 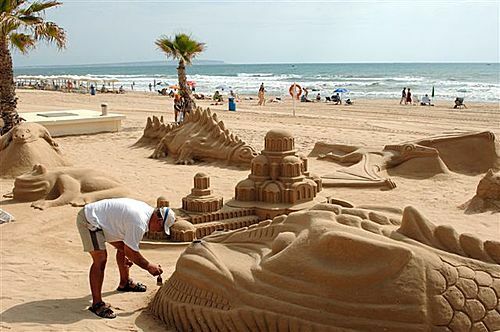 Like the Playa De Los Tusales, these fine sandy beaches are located near the mouth of the Segura River. 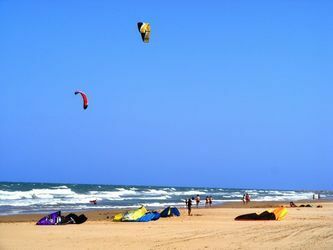 Eleven Kilometres of dunes and sandy beaches in Guardamar give people the chance to choose between isolated spots or more popular beaches. 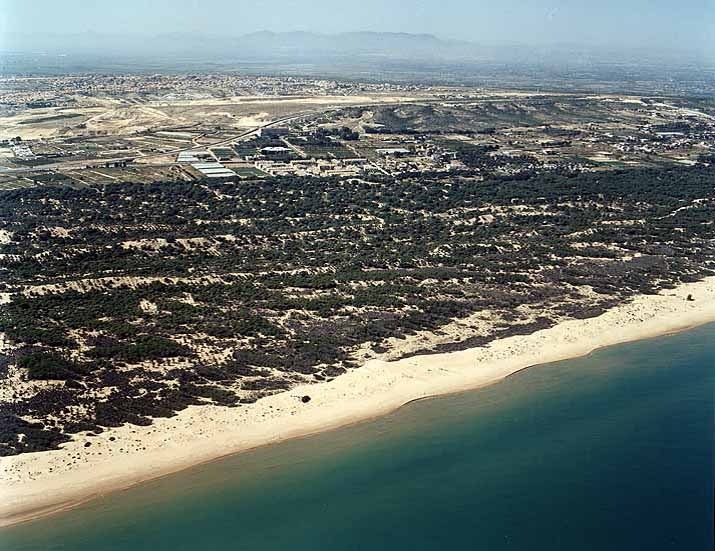 Another 5 kilometres of dunes connect Guardamar to La Marina in the north. To the south lies La Mata, a stretch of more marshy land which reaches as far as Torrevieja. Development in Guardamar del Segura has been slow and respectful of the environment. 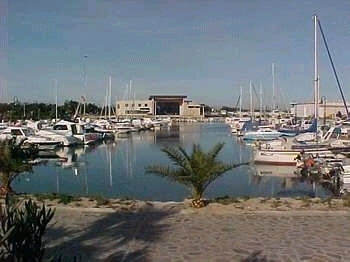 The construction of a sports marina near the mouth of the river Segura has added a new attraction to this select area. The gregarious nature of the inhabitants of Guardamar is reflected in the wide range of popular festivities on offer during the year. In winter the "Carnival" is celebrated. The arrival of spring hails and celebration of Easter. The "Passion of Christ" is reproduced in the streets, with all the scenes and processions showing through religious traditions an atmosphere of devotion and respect. On Easter Monday it is a must to eat the typical "Mona De Pascua" in the park "Alonso XIII" park, at the "Canal Del Tio Batiste" where all the families of the village meet to socialise and enjoy themselves. With Summer Solstice (21st June) the "Planta De Las Hogueras" become the centre of a lively celebration. On the night of "Saint John" effigies are burnt in a magical ceremony, where the people of Guardamar, who are known as Guardamarencos, the fire, and the sea are fused together in unique interaction. In the summer the most popular celebration is the "Fiestas of Moors and Christians", this is in the second half of July. The moorish warriors and the Christian troops parade and participate in mock battles, surrounded by the noise and smell of the fireworks and musket explosions, basic ingredient of these feasts. The most exciting moments are the landing of the Moorish ships on the beach and the representation of "L'Encanta" the old legend of the Segura River, in this Mediterranean site. In September and October the festivities in honour of the "Virgin of Fatima" and "Rosario" are celebrated, these are very popular fiestas in this region. The Summer University courses "Los Jovenes y Europa" are held in the first fortnight of July, with the participation of young people from different countries, who experience an incomparable experience once the academic year is finished. In autumn the emerita University is celebrated, a meeting point for older people, who share their social, leisure and cultural experiences in a natural environment. In addition, the "Guardamar School for Senior People" has been in existence for fifteen years and is a key to achieve the integration and cultural development of our older people, through different learning courses and the organisation of cultural trips. A wide range of seminars, symposium and workshops are held in the Cultural Centre "Casa de Cultura". The gastronomy of Guardamar de Segura represents the essence of the most pure Mediterranean cuisine. Healthy and natural food is its main virtue, and fresh products, are provided every day by the sea and the surrounding fertile fields. From the sea come the famous lobsters of Guardamar and the small tasty eels, which are caught at the mouth of the Segura River. Also from the sea comes gilthead, grouper, sea-bass, red mullet, sole, etc. to name just a few of the fish of these waters. The fertile land around the Segura river offers vegetables and fruit cultivated in a traditional way, with care and patience. Particularly interesting are the "noras" peppers dried by the sun on the dunes, giving an exceptional flavour to the cuisine of the region. With these excellent raw materials the genuinely "levantino" dishes are cooked, such as arroz a banda, arroz a la marinera or caldero, traditional dishes that fishermen prepared in their boats or on the shores. To start with, nothing better than tasting the salazones de pescado (fish macerated in salt), using an ancient preservation technique introduced by the Phoenicians. All this is only a small sample of the things that makes Guardamar a unique place for year-round living. One of the pleasures you can enjoy in Guardamar will be time. The days so pass peacefully, without hustle and bustle and you might get the most out of each day. You can visit the different archaeological sites, showing history that goes back more than two millenniums. 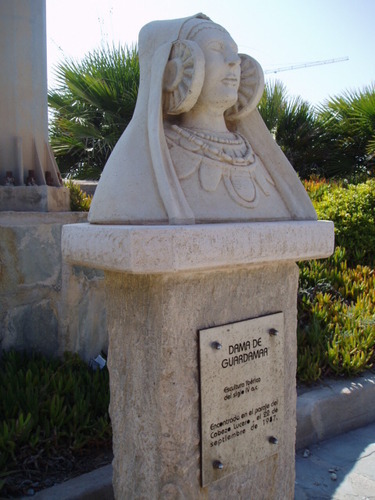 Outstanding the bust of the "Dama de Guardamar" and the mosques that forms the "Caliphate Rabita", a religious military complex from the Muslim period established on a hill near the mouth of the Segura River. Also of a great interest are the Iberian Village and Necropolis of Cabezo Lucero, where multiple objects of glass, metal, rock and pottery have been found, including the Dama de Guardamar. Many of these remains are conserved in the Archaeological Ethnological Museum, located in the Cultural Centre, "Casa de Cultura". Your trip through the history of Guardamar del Segura can be concluded with a visit to the Medieval Castle, situated on a hill that controls the Mouth of the Segura. Nautical sports lovers can practise their sport in the "Marina de las Dunas". 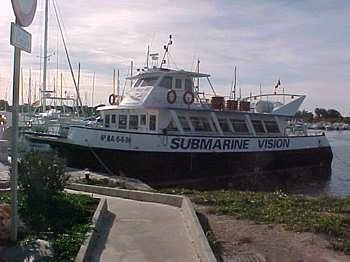 Sailing, windsurfing, waterskiing, scuba-diving, canoeing, jet skiing, etc. Guardamar del Segura has an excellent sports infrastructure, with the outstanding "Las Ribose" sport centre and the local municipal sport complex, with magnificent installations including an Olympic swimming pool, three football pitches, indoor football, basketball courts, tennis courts, fronton tennis, etc. Golf can be also enjoyed on the nearby Marquesa course, with eighteen holes, or in any of the other four courses located less than 20 km. 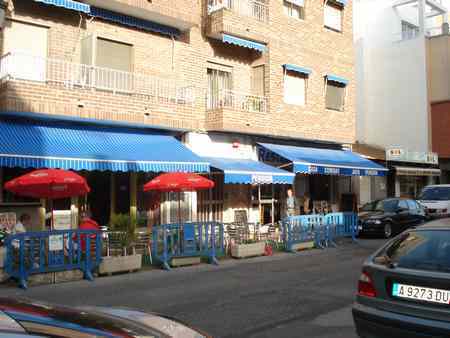 Situated 58 kilometres from Alicante on the N332. It is located in a flat valley between mountains, and the layout of the round alternates between long holes and short ones. It is not excessively difficult and so players of all levels will enjoy it. The most difficult factor lies in the characteristic layout of the greens, with their attractive and complicated slopes. The round is bordered by streams and lakes, which gives the course excellent views and provides beautiful natural surroundings to play in. The better plays might find it a bit too easy but the majority will find it very pleasant and will enjoy the excellent walk in a magnificent part of the country. The varied and pleasant round is lined with pines and palm trees. A wonderful location offering a very pleasant temperature both in summer and in winter.